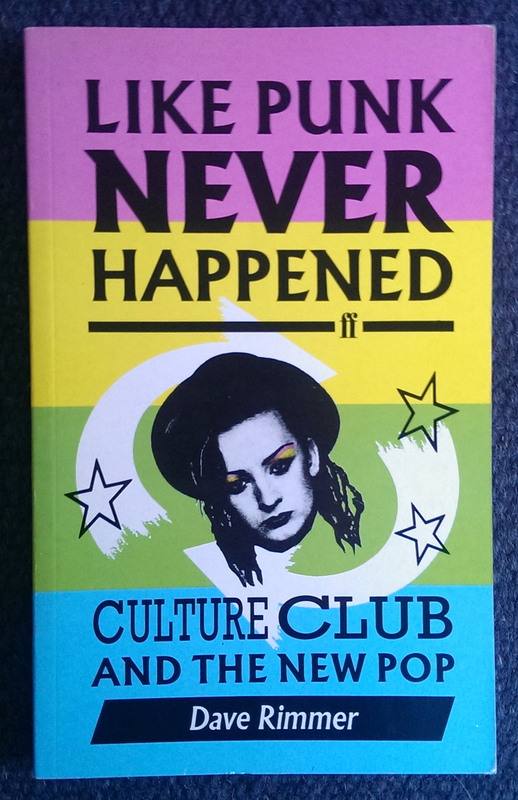 Having recently played at a ‘Keeping It Peel – John Peel Day’ event, I remembered about some notes I’d written on bits of paper, with the above title, ‘Whatever Happened To Rebellious Youth’. Once I’d found them, I then remembered that I hadn’t written a blog for several months (25th May, to be exact!…..Damn!!). So, here’s the late, lamented follow-up blog……..
To keep this blog pain-free, I’m including some images to help break up the text – think of it like an illustrated book, only much, much shorter (so short in fact, that it wouldn’t even equate to a brief chapter…Or maybe I’m doing myself an injustice?). I was called a ‘mature punk’ in a review of my live performance, when supporting Alan Clayson, a short while ago. Well, I quite like that…..& yes, if you must know, I did used to have short, bright red hair & dress like a skinny deckchair attendant wearing a variety of stripey deckchair covers, with hints of macho leather here & there. From a distance, I looked a bit like a very thin Briget Riley painting. Alas, that vivid hair colour treatment has taken it’s toll on my hair/head, but I still maintain a bit of ‘spikey-ness up top’ – retaining some integrity, I hope. So, returning to my original question, what has happened to ‘rebellious youth’? 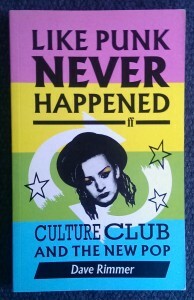 The book, ‘Like Punk Never Happened’, by Dave Rimmer, (published by Faber & Faber) discusses how ‘New Pop’ in the 1980’s took over from Punk, & eventually the record business again started calling the shots, rather than the artists/bands – who had suddenly lost control of their careers; their goals; their direction, & ultimately, their destinations. It became industry-led. Music had lost it’s ‘soul’, & ended up corporate. Punk had originally broken down the boundaries & taken control, showing that anyone could do it (& in some cases, unfortunately, some did!). However, all good things come/came to an end. The music had gone full circle. The big companies were in control once more. Well, the same seems to have happened to todays ‘scene’ (old-fashioned word, that…A bit like ‘hip’, which you realise later in life is more to do with ‘replacement’, rather than ‘a trend’). Record labels are still looking out for their own versions of successful acts, & consequently we get plagued with sound-a-likes of bands/solo artists we’d rather not have heard in the first place. Oh woe! I shan’t mention names, but there are the singer-songwriters who sound as though their vocal chords have been strangulated, & consequently sing in high, wimpish, nasally, washy tones, that lack clarity of pronunciation. I’m not sure why some singers bother to write words, when you can’t even make sense of them…& it’s not as though they’re belting them out, either (they’re usually quite quiet, gentle songs)! Other acts/bands try to have a ‘jolly good foot stompin’ feel & beat to the numbers, forgetting that the songs need content, too…….Well, both genres are my pet hates, anyhow! So, before I sound like an embittered man, the point of all this rambling leads me onto the crux of this blog (if you’re still with me?? ), & that is, where is today’s rebellious youth? Open mic nights are a chance for new talent to show off their wares. 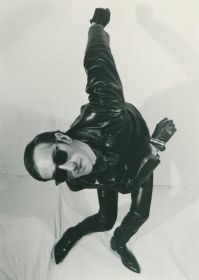 Alas, some of the time (although there are several exceptions) there are performers emulating present limp stars – that make for a very MOR experience. If I wanted that, I’d stay at home & listen to BBC Radio 1 (thankfully, I don’t…..I couldn’t!). It’s either a stereo-typical pop performer, or it’s regressive old school. Now, there’s nothing wrong with looking back to the past, but for gawd’s sake, reinterpret the song/style/era, not just copy it – I even heard a straightforward version of ‘Streets Of London’ earlier this year! Believe it or not, there are some people out there who still haven’t forgiven Bob Dylan for taking up the electric guitar. I say, ‘Get over it!’. It doesn’t seem right, young performers playing so ‘safe’ with their choice of numbers. They’ve listened to their parents very cosy record collection, & picked out stuff that came & went years ago. It’s all too easy listening…..Too Val Doonican (if you don’t know who that is, Wikipedia it). We need to move on. Emulate to innovate!! 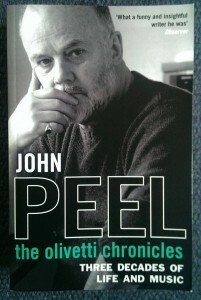 John Peel was a great advocate in wanting ‘to be challenged’ by the music he was listening to. 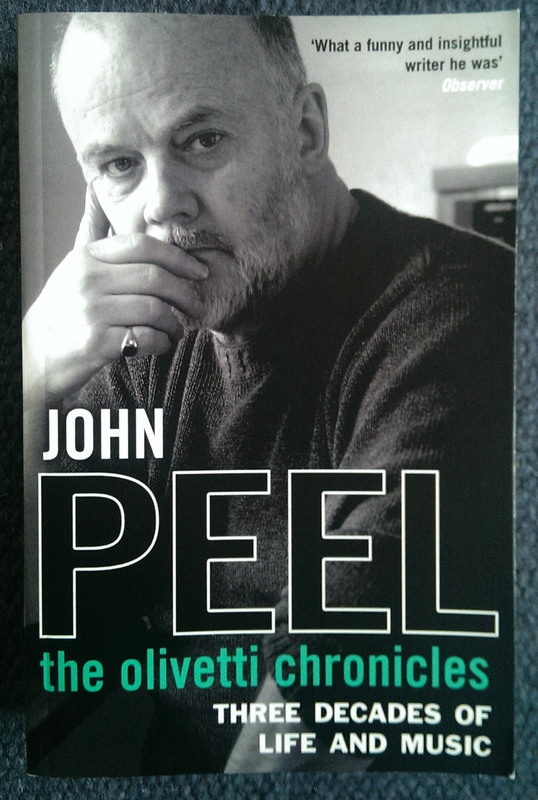 The book based on his reviews & articles, ‘John Peel, The Olivetti Chronicles’ (published by Corgi Books), shows how much he liked to be confronted by new styles & radical approaches in music….& in life, generally. Were he still alive, he’d be happy to hear something fresh & original – who wouldn’t? However, it does feel, yet again, that ‘Punk never happened’. Since, the further we get from the book’s ethos, the more crucial it should be to rebel musically………..